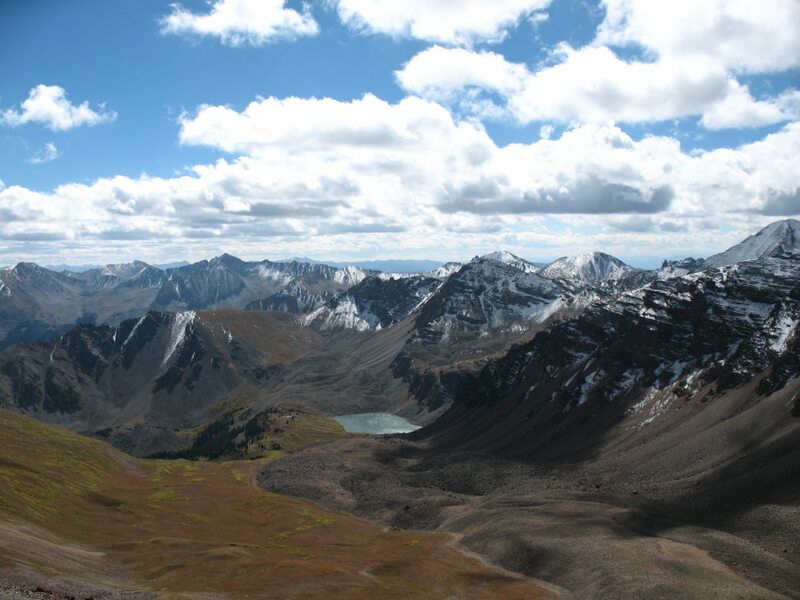 Colorado’s high country is full of renowned hikes to 14,000-foot peaks, deep into the backcountry or up and over remote passes. But scattered throughout the state are hundreds of marvelous and pristine high-mountain lakes well worth a visit. 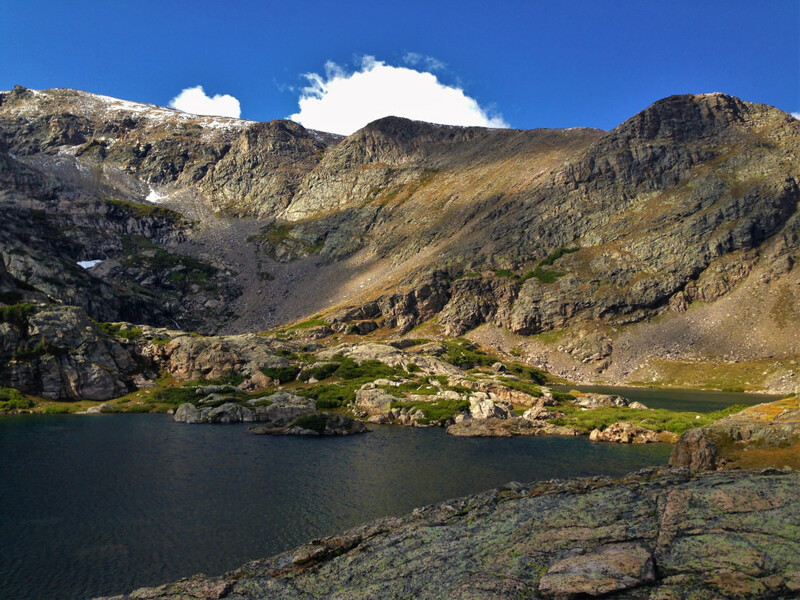 Soak your feet, dunk your head, and check out these Colorado alpine lake hikes that should be on your radar. The 4.3-mile hike to Heart Lake begins at the east portal of the Moffat Tunnel. There is a large parking area next to the historic train tunnel, about 10 miles east of the town of Rollinsville. The trail takes you past the tunnel, crossing the South Boulder Creek a few times as it trickles down from the Continental Divide. Follow signs for South Boulder Creek Trail past the turn offs for Arapaho Lakes, Forest Lakes and Crater Lakes. It becomes moderately steep and you will gain about 1,900 feet in elevation by the time you reach Roger’s Lake. This is a great place to take a break and enjoy the views of Roger’s Peak before making the final push. You will climb out of the trees and up a steep 0.2-mile face that leads you to a ridge just above Heart Lake. From here, you have views of two incredible lakes and the entire South Boulder Creek drainage. 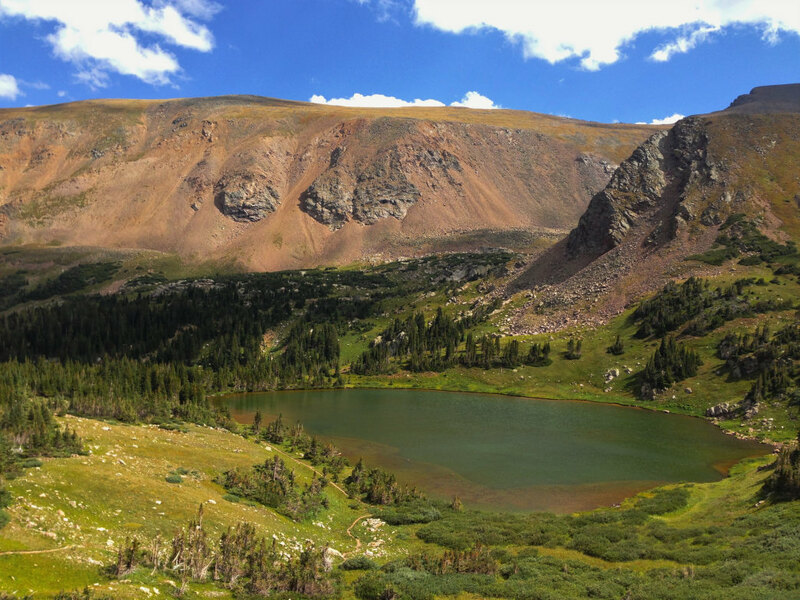 These picturesque lakes sit above the historic town sites of St. Mary’s and Alice in the James Peak Wilderness. The area is an easy hour drive from Denver and sees heavy traffic throughout the year due to the nearby St. Mary’s Glacier. Skip the glacier and head to the trail, starting at the intersection of Alice Road and Steuart Road. The first 2.4 miles scale past timberline to Loch Lomond, the first and largest of the lakes. Continue along the west end of lake toward the waterfall and climb an additional 800 feet to a series of three other alpine lakes. This is the steep and strenuous part of the hike where you will have a few water crossings, minor scrambling and terrific views of Loch Lomond below. The hike flattens out as it winds around Reynolds Lake on its way to Steuart and Ohman Lakes. The total distance to Ohman Lake is 3.5 miles over 1,200 feet of elevation. The hike to Cathedral Lake may be one of the best ways to take in all of Colorado’s mountain beauty. 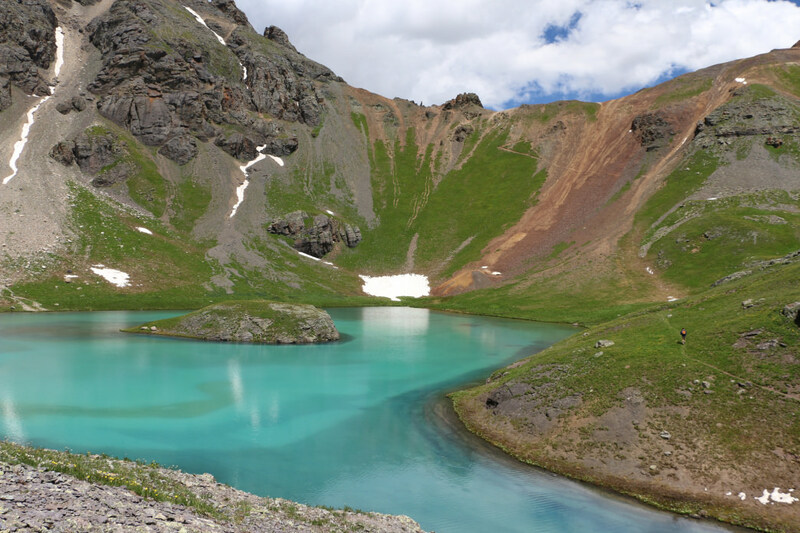 Located in the Maroon Bells-Snowmass Wilderness area, Cathedral Lake offers the unforgettable turquoise blue water. The surrounding mountains are some of the state’s most incredible, rugged peaks. The trailhead is located 13 miles south of Aspen, along Castle Creek Road. The 2.8-mile trail rises through aspen groves along a creek of dense willows and well decorated wildflower meadows. Though relatively short, the hike traverses steep terrain and gains a grueling 1,980 feet. Cathedral Lake sits well above treeline surrounded by three profound 13ers. 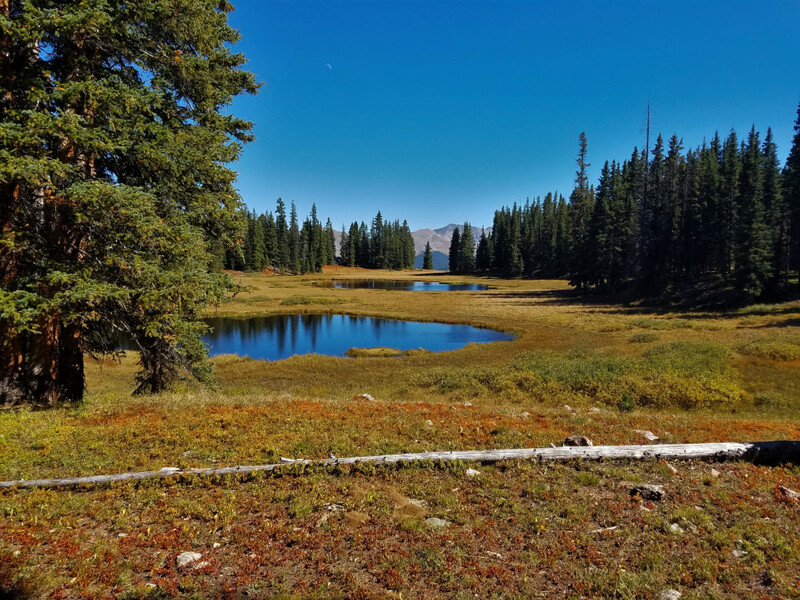 The hike to Wheeler Lakes is perfect for a quick afternoon getaway or a colorful autumn trek. The trailhead is so obvious that you could easily miss it, beginning, as it does, next to the off-ramp from I-70 to Copper Mountain. The first mile zig-zags through aspens and pines with views of Copper Mountain to the South. The first half of the hike will get your heart rate going as you cover most of the 1,400 feet of elevation gain. It flattens out around 11,000 feet as the trail winds through meadows and past nice overlooks with views of the Holy Cross Wilderness to the west and Tenmile Range to the east. Wheeler Lakes are 3.1 miles from the trailhead and sit within thick pine forest. A bonus option would be to carry on past Wheeler and make your way back down Officer’s Gulch. Just plan ahead and leave a car at the Officer’s Gulch trailhead. The San Juan Mountains in southern Colorado are home to a few notable glacial lakes, but possible the most unique is Island Lake. This is a challenging hike with almost 3,000 feet of elevation gain that takes you well into the Upper Ice Lake basin. The lake is an aquamarine blue with a rock mound jutting out of the center, creating the island for which it was named. The trailhead is next to the South Mineral Campground located along Forest Road 585, about 19 miles west of the town of Silverton. The hike is a 4-mile incline and maintains a steep and exhausting grade. Along the route, you will see old mining equipment, waterfalls, abundant wildflowers, and views of many 13ers, including Ulysses S. Grant Peak hanging above Island Lake. The lake’s elevation is 12,400 feet and you can add a bonus lake to your descent by traversing about a half mile south to Ice Lake (12,280). Ice Lake’s water is a lighter, brilliant blue and feeds a waterfall that can be seen on hike back down the Ice Lake Basin. The entire loop is just over eight miles. At the mid-point or all along the way of all of these hikes are stunning views and cool, refreshing water. The only disappointment will come when you need to leave these sparkling gems for home.